Recently, I haven’t been feeling very well. I’ve lost some weight because I haven’t been very hungry. Mom took me to see Dr. Steve. He is a great vet. As soon as he felt my belly, he made me sit under this big camera called an x-ray machine. What he found surprised even him. My belly even made it to his facebook page! This is my tummy! Those little dots are the rocks I eat outside. They usually come out with no problem. That big onion-looking thing is a bladder stone. 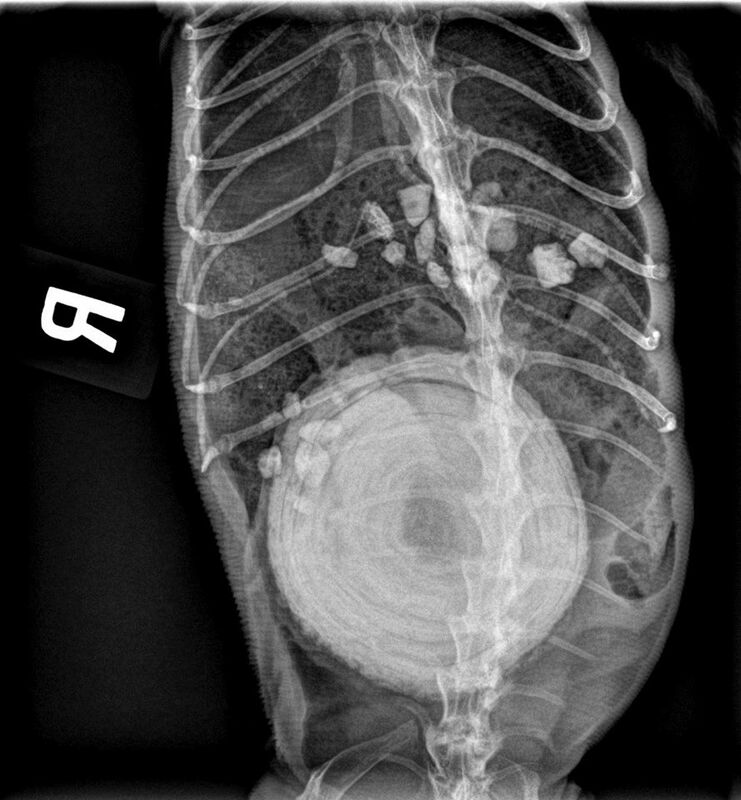 It seems that in iguanas, bladder stones form in concentric rings. This stone has been in me for a long time but you can only really feel it if you squeeze my belly. It’s gotten so big now though that it is interfering with my ability to eat and poop. The only way to get it out is to have surgery. Dr. Steve will have to make an incision in my tummy and then my bladder. He will clean it out real good and stitch me back up. Once I get home I’ll have to stay separated and fairly calm until my stitches heal (which is really hard because I’m in breeding season right now and all I want to do is chase the other iguanas!). Mom has been pretty nervous about the surgery. She has been letting me sleep in the bed with her. Dr. Steve is a good doctor and he knows a lot about reptiles so I’m sure everything will go fine. I’m not looking forward to surgery but it will be nice to get rid of this stone! And I can’t wait to eat a big plate of salad again (and all the treats mom will give me while in recovery hehe)!